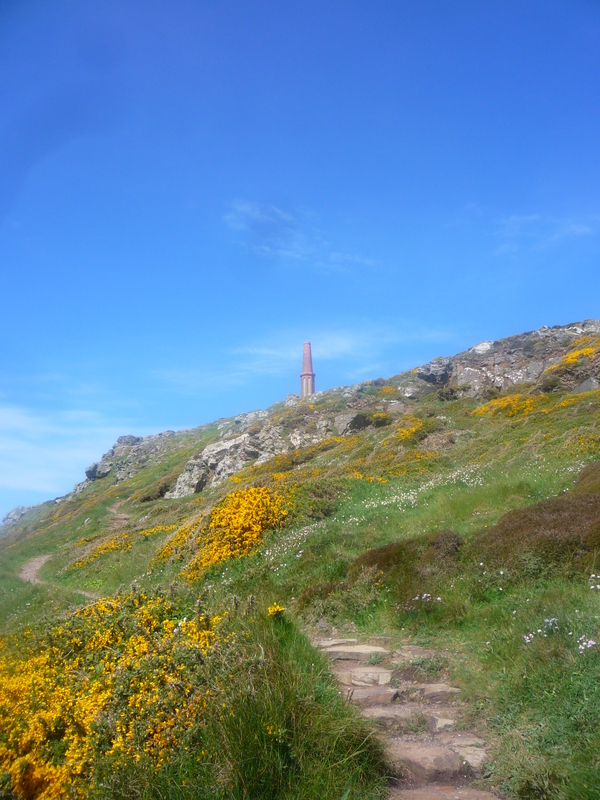 Cape Cornwall provided the backdrop to a stunning day out on the Coast Path last Friday. The Queen was visiting St Ives and there were hardly any people about, save for a producer of German TV documentaries Manfred Schuchmann and his camera crew. Sitting atop the Cape, the only one in England, waiting for the Palace security helicopter to pass, we caught sight of a kestrel hovering just metres away from us, before diving down to the base of the cliffs for its prey. The offshore rocks of The Brisons still look like Napolean in the bath with his Roman nose and double barrelled chest rising above the surface of the water. Priest’s Cove sparkled as the sun reflected off the sea and the path leading down to it was lit up by golden gorse. Wondering how the chimney on top of the Cape came to be there, we had different theories. Manfred thought it was a monument donated by the Heinz company as a tribute to the Cornish Mining industry that was revolutionary in its heyday. The commemorative plaque would lead to this assumption. However, it is in fact a relic from an engine house that once sat at the base of the Cape. Heinz company bought the Headland in 1987 to commemorate its centenary and donated it to the National Trust who now maintain and manage the site. Recently, a new route was installed on the seaward side linking the Cape to the National Coastwatch Institution, whereas previously walkers were guided around it. 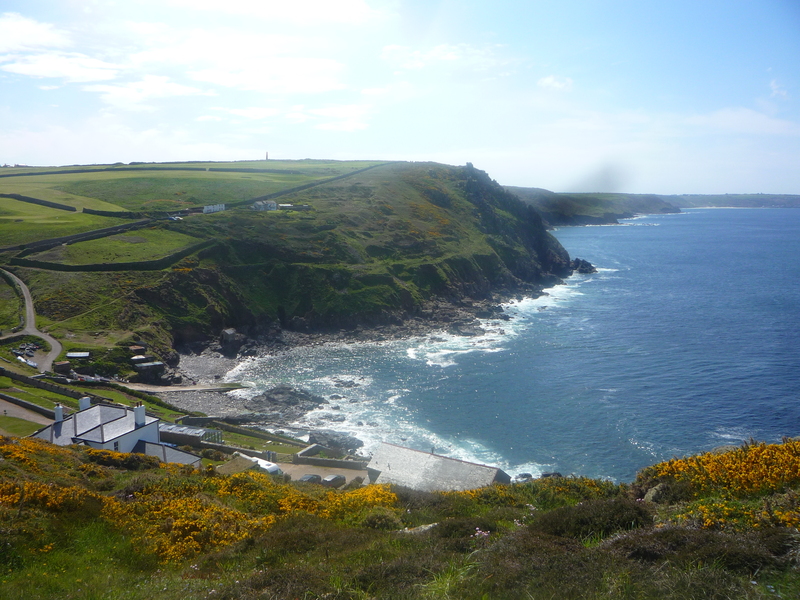 A cape is generally defined as a headland dividing two seas, and Cape Cornwall was thought to mark the division between St George’s Channel and the Irish Sea on the one side and the English Channel leading to the North Sea on the other. 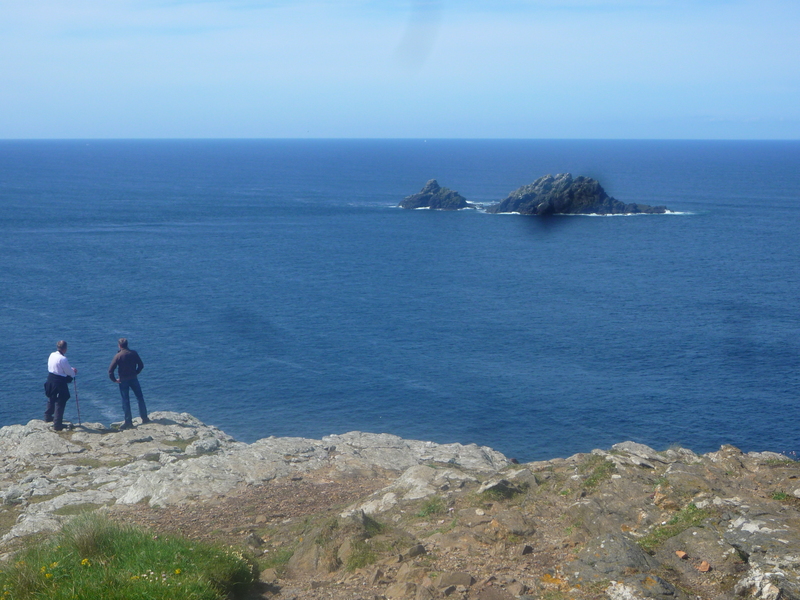 At the same time it was thought to be the country’s western extremity, rather than Land’s End. Next Next post: Get set, go….